« Netflix rolls out unlimited Internet viewing option – preemptive strike against Apple? 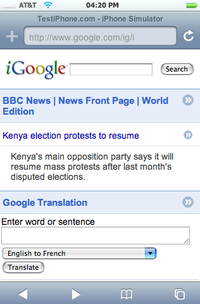 The fact that Google unveiled a new user interface today for its iPhone Web apps is noteworthy but hardly significant. What is interesting is the subtle shift going on behind the scenes. Vic Gundotra, a vice president of engineering at Google, told CNet that — as a result of lots of people getting iPhones for Christmas presents — the number of queries on Google search from iPhones surpassed the number of queries from Symbian-based phones for the first time. Think about it. Symbian is the market leader, used on phones from Nokia (the world’s No. 1 handset manufacturer), Motorola, Samsung, and Sony Ericsson, among others. The iPhone’s user base is comparatively teeny-tiny since the phone’s introduction last June. By providing a quicker, slicker user interface, more customization, iGoogle gadget integration, and more speed for all apps, Google is acknowledging the iPhone’s rosy future. iGoogle on the iPhone can be reached by pointing the phone’s browser at google.com/ig/i. The standard mobile version of Google, made available just over a month ago, is still available at google.com/m, but it’s more limited and is available only in the U.S. It brought together a suite of applications like search, Gmail, Calendar, and Reader into one easy-to-use interface. 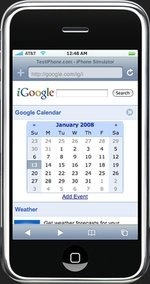 With Google for the iPhone, users will get an improved UI optimized for the touch screen, customization of default tabs (easy access to favorite applications), faster Gmail (email automatically show up, no refreshing needed), a speedier Calendar (including a new month view), and iGoogle. Heavy users of Google services will find the new Google iPhone interface significant, but if you’re not into Google it’s noteworthy — and a sign of more to come. Excellent! Now all I need is an iPhone to run my gadgets on. This should be great though, iGoogle has thousands of widgets that all suite the iPhone screen well. I hope my own gadgets work well on it. Wonder if my ZX Spectrum gadget will? Anyone out there got an iPhone?